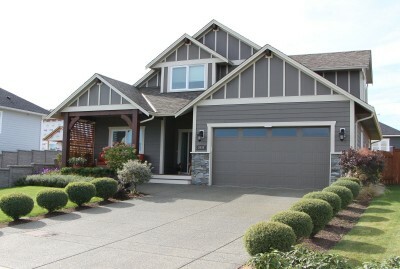 Take in all of the best of Vancouver Island living from your new home at The Gales in Ladysmith. Even in the winter months, you can enjoy the outdoor spaces and ocean views in on of Canada's most temperate climates. The luxury patio/town homes at The Gales feature top-to-bottom luxury - from the ocean view balconies and patios, to the luxury finishes throughout. And it's all designated Built Green® platinum. Every detail is taken care of by award-winning GNB builders. 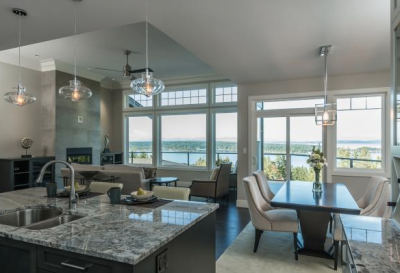 Homes at The Gales in Ladysmith feature dramatic styling and wide open spaces which reflect the ocean and mountain views enjoyed from this hill-top real estate development. Tour the current show home at The Gales - a 3,000 sq ft home with an open floor plan - and take in the ocean views for yourself. The latest home under construction, unit #18, is priced at $709,000. Units 16 & 17 are expected to begin construction soon. In 2016 more properties have been purchased within the Crown Isle Community than in any other year in their 27 year history! Courtenay and the Comox Valley currently has one of the strongest real estate markets in British Columbia. Over the course of the next few months, Crown Isle plans to register 74 single family lots in four different subdivisions. To date, 49 of the 73 lots have been reserved by the mater planned golf course development's builder partners and by private clients. What's next? The community will extend Crown Isle Drive to add another 55-60 lots, which will connect Crown Isle Drive to Idiens Way. As well, Phases III and IV of their north side development The Rise, will continue east from Phase I. 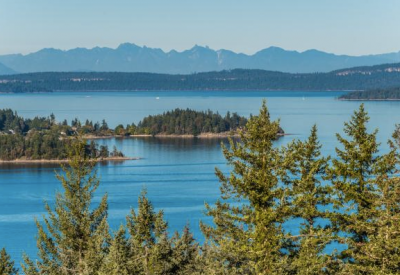 They will continue to build new lots to keep up with the demand for new homes in the Crown Isle Community, the perfect place to live on Vancouver Island! 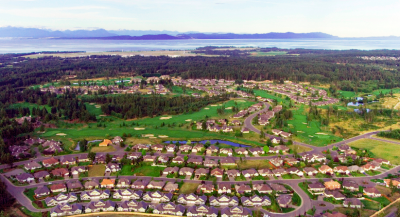 The Ridge, a new master planned community in Courtenay, is now planning for Phase II, which will feature of 43 lots. Site construction is expected to start in January of 2017 with lot construction and registration expected to be complete in April, 2017. Home construction in Phase II will then be set to begin. This modern development in Courtenay will eventually include 230 single-family homes — some with lane access – zoned to allow carriage homes, workshops, and secondary suites. There are also residential lots for duplexes, bungalows, and patio homes. During home construction in Phase I, The Ridge has welcomed new residents from Metro Vancouver, Ontario, Alberta, and other Vancouver Island communities including Parksville and Victoria. The developers invite you to come and see The Ridge, and the beautiful scenic views it offers. Please contact them - they would be delighted to give you a personal tour. 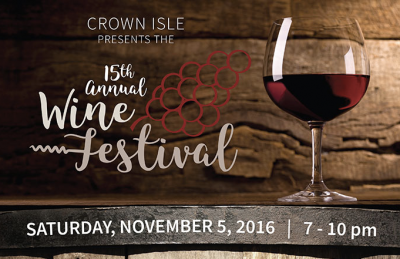 The Crown Isle Wine Festival is back on November 5th! Come and join the community for a fun-filled evening of wine testing. Imported and domestic wines will be featured along with food and live music. This has proven to be a very popular event over the past 14 years, and is always a sell-out! Please contact the Crown Isle Resort Front Desk at 250.703.5000 for tickets. Tickets are $65 and must be purchased in advance. Sip and Stay packages are also available. Learn about other seasonal specials at Crown Isle here. While you are at the Resort Centre, drop by their real estate office, located in the front lobby of the Clubhouse and find out about the development of Phase II of The Rise Subdivision located across from Costco. Crown Isle has started site services construction on Phase II of The Rise; lots are expected to be registered in late October or early November. Nineteen of the 28 lots have been reserved. Two lots remain for sale in Phase I, with prices starting at $175,000. Numerous homes are now under construction in Phase I. 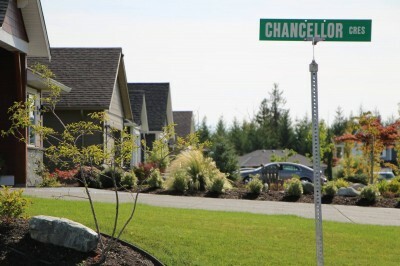 This subdivision is located north of Galaxy Motors and located across from Costco on Crown Isle Boulevard in Courtenay. Prices of the remaining lots in Phase II start at approximately $170,000. Contact the Crown Isle real estate team and they will be happy to also talk to you about your plans for building in the Crown Isle Community on beautiful Vancouver Island. Nobody knows Crown Isle like they do! Art Meyers, Realtor with Royal LePage in the Comox Valley is working with his customers to get the best prices in a competitive and quickly changing real estate market. He is able to get top dollar for his clients, as he keeps his eye on the rapidly changing market. Having spent 40 years in the real estate business, he is one of the most successful and experienced Realtors serving Comox, Courtenay, the Comox Valley and Cumberland. Art's extensive real estate background includes many years of listing and selling all types of new homes, ranchers and bungalows in the Comox Valley on Vancouver Island. Always a top producer, he will work closely with you to buy your new Vancouver Island home including ranchers, bungalows, single family homes, condominiums, townhomes, duplexes, & acreages; and more. He can also assist you in obtaining top market value for your existing home. As part of this master-planned community, developers have built two parks within The Ridge subdivision in Courtenay on Vancouver Island. Community amenities such as these parks provide places for recreation and neighbourhood gatherings, and help create a greater sense of community. As this new Courtenay development moves into its second phase, residents are taking advantage of these fabulous features. One park is 1.5 acres large and is suitable for all kinds of play, including soccer, frisbee, football, and catch. This park is fully grassed, irrigated, and landscaped and also features a children’s play structure. This park has street lamps surrounding it so that it is lit up at night. It's a perfect place to go for a stroll, to relax, see the view, or participate in some activities. The parks and walking trails are just a few of the things that make The Ridge such a wonderful community. The wonderful residents and welcoming neighbours complete the feeling of community. While much the rest of the country prepares for their first snowfalls and freezing temperatures, residents at The Gales are still strolling nearby beaches and neighbourhood forest trails. Set on the coast of Vancouver Island, in one of Canada's most temperate climates The Gales is a 68 condo and patio home development, featuring luxury villas-style living. Perched high above the ocean on a rocky outcropping, The Gales is located near the Ladysmith Harbour and the historic downtown. Curved streets, cul-de-sacs and manicured landscaping help build a sense of community here. Walkways meander throughout the development and where they pass between residences privacy has been retained via the use of arbours and trellises. Tying in the proximity to the ocean, all street lighting has a nautical theme. With grounds-keeping included at The Gales you will enjoy freedom from yard and maintenance work, leaving more time to enjoy everything that this Island lifestyle has to offer. The architectural style is West Coast Contemporary, with warm earth tones and a variety of darker tones to complement the coastal landscape. More than beautiful ocean and mountain views, this luxury neighbourhood includes mature trees and rock outcroppings. The natural surroundings include forest, hiking paths, a mountain stream, and wildlife. Apart from city life, yet close. The climate is mild and the outdoors are at your doorstep.